Tee off in our coastal paradise for a day of golf. Play championship courses nestled along the beach and the bay. Lakewood Golf Club on the Robert Trent Jones Golf Trail. The epitome of deep-south beauty and charm are in full splendor at Mobile’s Robert Trent Jones course Magnolia Grove. Perfectly manicured greens and pristinely pruned flowering plants make this a true southern experience. Mobile’s 18-hole Azalea City Golf Course is just as lovely as any you can find, adding to the area’s reputation as a premier destination for golf enthusiasts. The historic, renowned Grand Hotel Golf Resort & Spa in Point Clear hosts one of the famous Robert Trent Jones course: Lakewood Golf Club. 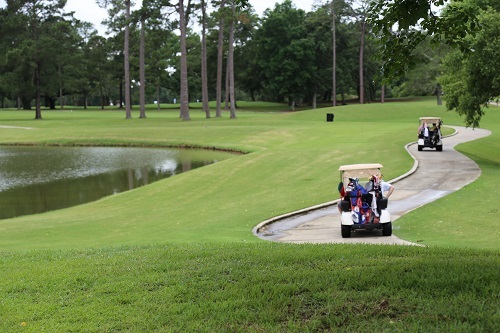 This bayside resort and course is surrounded by ancient live oaks, azaleas, camellias and gardenia. The resort offers amazing views, restaurants, cabanas, pools and meeting spaces. Just as lovely are Timbercreek Golf Club, Steelwood Country Club, Quail Creek Golf Course, Rock Creek Golf Club and Lake Forest Golf Club. Hit the links at the Holly Hills Municipal Golf Course, where oaks, pines, magnolias and holly bushes make for gorgeous holes any time of the year. Half a dozen courses on beautiful “Pleasure Island” offer postcard-worthy, Gulf-side views, lakes and wetlands. Don’t miss Kiva Dunes, Peninsula Golf Racquet Club, Craft Farms at Cotton Creek or Cypress Bend, and the Gulf Shores Golf Club. Almost all can brag of 4 or 4.5 Golf Digest ratings and some of the prettiest terrain and views in the south, making the Island a golfer’s Heaven. The beautiful lakes, manicured greens and lovely magnolias and azaleas make Foley’s GlenLakes Golf Club another great place to tee off in Coastal Alabama. The Isle of Dauphine Golf Club offers a beach-side course, as well as a resort offering cabanas, pools and meeting spaces.